Eugene M. Lang ’38 and the Board of Managers of Swarthmore College created the Swarthmore Project Pericles Fund (PPF) in 2005. The purpose of the Fund is to supports groups of Swarthmore students who propose and implement social and civic action projects whose scope and sustainability will advance solutions for the issues in question and also promote recognition of students' motivation and capability to address such major issues effectively. Any team of two or more currently enrolled students may apply for grants of up to $25,000 to fund projects that are visionary in scope and groundbreaking in practice. Projects may have a regional, national, or international focus. Students whose formal proposals are accepted and receive Project Pericles Fund grants are designated Periclean Scholars. Applications are accepted on a rolling basis. 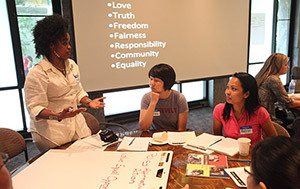 Based upon the Lang Center's commitment to engaged scholarship and ethical intelligence, students who are interested in applying for a grant from the Project Pericles Fund must have taken coursework that is directly relevant to understanding their issue area, unpacking the social problem, and/or designing project elements. In some cases, the project could be developed in the context of the class with the faculty member instructing the course serving as an adviser to the students as the project proposal emerges and comes to fruition. Alternately, another faculty member—preferably one whose scholarship and expertise is germane to the project at hand—can serve as a project advisor. Students who are named Periclean Scholars and receive grant funding would need group members to commit to taking relevant courses throughout the lifetime of the grant. At the beginning of the fall or spring semester, prospective Periclean Scholars should co-create a project concept following the guidelines below. Lang Center staff and faculty can provide feedback and recommendations as the project concept is developed. The team will be invited to participate in public “concept pitch” (specific date/time/location, TBD). Teams are encouraged to practice their pitch, perhaps seeking support from the Writing/Speaking Associates and/or the Center for Innovation and Leadership. One week prior to the pitch date/time, the team should email Jennifer Magee (jmagee1) a one- page summary -- following the "Concept Pitch" guide below -- that includes the project title and an abstract of about five sentences. A successful abstract will tell us what the issue or problem is, and note where it occurs (1 sentence); it tells us about the specific constituencies who are directly impacted by this issue or problem (1 sentence); it will describe how the project addresses the problem or issue described above (1 sentence); and it will tell us what your solution is, what change(s) or outcome(s) you anticipate seeing as a result of your project (and for whom) (1 -2 sentences). (5 sentences total). A concept pitch is a 3- to 5-minute opportunity to convey eight essential things about your project idea or “concept.” Pitches should conclude with an “ask” of the audience—for seed funding; for advice, participation, or other support; for permission to submit an application for full funding, etc. The audience for your pitch could include members of the Lang Center advisory board, faculty, staff, community members, and so on. VISION & SCOPE: The vision and scope of a project to foster systems/structure change or otherwise create social impact. TEAM: Introduce members of the student team (names, major/minor, class years, student ID numbers) and the capacity of the students to enact a project, as evidenced by related experience and study. Refer to non-student team members, if known and applicable. DESIGN: Processes and methods by which the project could be implemented. STAKEHOLDERS: Who are the stakeholders and how will they be engaged in the project design, implementation, and/or evaluation of the project? Provide evidence of stakeholder support. DEMAND: Is there demand for a project like this? How do you know? FEASIBILITY: Feasibility of the project design, if known. SOCIAL IMPACT: Anticipated impact of the project in terms of measurable outcomes in the near and long term. THE ASK: Do you need seed funding ($500) for further research and project design refinement? Are you requesting permission to submit an application for full funding? Note: If you cannot respond to the prompts above, you are probably not ready for the pitch. Fear not! The Social Innovation Lab @ The Lang Center is a space populated with caring professionals who can help you explore, develop, and modify project ideas. Contact Denise Crossan, Lang Visiting Professor for Issues of Social Change, to learn more about the programming and services available through the Social Innovation Lab. Student groups who engage in the concept pitch may receive seed funding for further research, and ultimately find that their project idea is not feasible. In that case, teams are under no obligation to enact a full-scale project. If seed funding is unused, however, it should be repaid to the College. Student groups who receive permission to submit an application for full funding (up to $25,000 over multiple years) will be invited to participate in a facilitated design thinking process. Then they may choose whether or not to take their idea forward. If a student group chooses not to go further, the students will report to the committee again about what they learned through the course that influenced their thinking about the project design and its lack of feasibility. If a student group chooses to go further, the students will complete an application together that will be submitted to the PPF committee for review. As part of the application, team members will need to submit a multiyear course plan that outlines how the courses they take will influence/inform the design and implementation of the project. New faculty may be invited to serve as project advisers. Contact Jennifer Magee for a copy of the PPF application. Vision & Scope: Successful applicant teams will propose to work on a communal, regional, national, or international issue to address the underlying causes and conditions of a specific societal problem. Mission Statement: Successful applicant teams will have crafted an eight-word mission statement that clearly articulates the goals and objectives of the initiative as well as the direct beneficiaries. Team: Successful applicant teams will have at least two student leaders on campus during the life of the grant, preferably from different class years; will articulate the qualifications and unique contributions of each team member; and will commit to completing Training Needs Assessments annually to determine gaps in team composition; and to working with the Periclean Scholar Adviser to identify strategies and opportunities for offsetting those gaps. Well-Defined Objectives & Innovative Strategies: Successful applicant teams will have well-defined, measurable objectives as well as innovative, entrepreneurial problem-solving strategies. These objectives should reflect values of the team such as inclusion, fairness, diversity, democracy, justice, and opportunity. These elements will form the framework of their plan of action. Feasible Work Plan: Successful applicant teams will demonstrate that their plan of action is feasible, that the team possesses or will obtain the necessary skills and experience to do the work, and that a grant from the Project Pericles Fund would enable them to obtain sufficient resources to meet their goals. Evidence of Stakeholder Support: Successful applicant teams will obtain letters of support from others working on this issue or similar issues who endorse the proposed work of and agree to collaborate with the applicant team, exchanging resources, information, and advice as appropriate. Sustainability: Successful applicant teams will outline a general plan to build capacity of the project constituents (human resources) as well as the team’s demonstrated ability to conduct fundraising (financial resources) to sustain the project beyond the term of Project Pericles funding. Social Impact Measurement: Successful applicant teams will outline a general plan to evaluate processes and outcomes of the project. Reflection on Learning: Successful applicant teams will enumerate their individual and group learning goals, as well as how the courses they will take and the project work they plan to do will help to achieve these goals. Faculty Adviser: Successful applicant teams will have identified a faculty member—preferably one whose scholarship and expertise is germane to the project at hand—who will serve as a project adviser. regarding the School to Prison/Confinement pipeline for children in Chester, PA with incarcerated family members. We plan to work with students with an incarcerated parent and/or guardian whose family members have shown interest in providing their children with additional academic support that focuses on literacy, leadership, and chess. Chester Youth Court Volunteers (CYCV) is an innovative youth-empowerment program at Chester High School that serves and trains high-school students in law and civics, leadership skills, and youth court procedure. CYCV members conduct hearings for their peers who have committed disciplinary offenses, working together to create a constructive sentence that will help their peers. CYCV is a positive disciplinary alternative to suspension that empowers Chester students to engage in civic service while gaining important leadership skills. CYCV mission was to support and expand the activities of the Chester High School Youth Court. They supported Chester students by volunteering on-site at Chester High School. The role of Swarthmore students on-site was to provide guidance and support during youth court trainings and hearings, as well as provide leadership training and opportunities for academic achievement and access to higher education. Common Ground Solidarity Network (CGSN) convened "Thinking Globally, Acting Locally," a one-day conference on post-Hurricane Katrina Gulf-Coast 5 in May 2006. Hosted at Swarthmore College, CGSN continued to raise awareness of the short and long term issues that arose in the aftermath of Hurricane Katrina. The conference brought students from the University of Pennsylvania, Haverford, Bryn Mawr, Ursinus, and Widener as well as Swarthmore to create a network and working framework for social change in local and global communities. The overarching principle guiding this conference and the work of CGSN was that a critical mass can achieve an anti-racist, anti-classist society. Global Health Forum (GHF) sought to improve global health through raising awareness, cultivating partnerships, and pressuring political initiative. Founded in January of 2007, the Global Health Forum, one of their initiatives was "Minus Malaria." The purpose of this campaign was to educate and inspire college students to become agents of change in the fight to eradicate malaria and other infectious diseases. Global Neighbours (GN) aimed to eliminate the discrimination and promote the dignity of people marginalized because of medical and/or physical conditions. GN's primary goal was to build and develop mutually enriching and sustainable relationships with the communities GN works with. GN worked toward this goal by cooperating with organizations, volunteering, and raising awareness working with community partners Children and Adult Disability and Educational Services (CADES) in the Swarthmore, PA and Joy in Action (JIA) Network in China. Pémon Health was a community-based organization whose mission was to demonstrate initiatives designed to provide sustainable improvements in the health of Pemón villagers. The Pémon Health team was composed of Swarthmore college students, local leaders in Urimán, and Venezuelan healthcare professionals. The primary objectives of Pemón Health was to work with Pemón leaders to implement effective community-level health initiatives; to provide summer interns with an opportunity to gain a better understanding of patient medical care by working with village doctors in rural medical clinics in southern Venezuela; and to serve as a model for other student-led organizations focusing on global health and community-level development. After their tenure as a Project Pericles funded group, Pemón Health received a Davis Project for Peace award; group founder, Yonjun Heo, also received a Clinton Global Initiative University grant to further support the work of Pemón Health. Sudan Radio Project (SRP) (originally called Darfur Radio Project) came to life in the fall of 2006, drawing members from across all academic years. Inspired by the members' involvement in Swarthmore Sudan, the Genocide Intervention Network, and War News Radio, the SRP aimed to shift the lens through which we understand and engage with the genocide in Darfur as well as the north-south and east-west conflicts within Sudan. Students Against Violence Everywhere (SAVE) R Us included a double mentorship program in which college students trained high school students as Peacemakers, and high school students mentored elementary students in skills to prevent bullying and to learn effective nonviolent conflict resolution skills. Brandon Lee Wolff '07, founder of SAVE R Us, received a Best in Leadership Student Visionaries Award from Cabrini College, which honored outstanding social entrepreneurs. Swarthmore-Sudan (SWAT Sudan) worked to end the genocide in the Darfur region of Sudan. They used Pericles funding to organize a national conference of college students already working on the issue as well as those interested in starting a program at their own colleges. Village Education Project (VEP) was a non-profit foundation founded in August 2005 by Katie Chamblee '07 and operated by a staff of Swarthmore students. VEP worked to empower rural villages by making education an accessible and sustainable local resource in four villages that surround Otavalo, Ecuador: Mojandita, Chuchuqui, La Joya, and San Juan de Capilla. Many of the students from these sponsored villages were members of the Ecuadorian rural indigenous population, a traditionally disadvantaged social sector. When VEP supports the educational needs of village students, both the families and entire communities reap the benefits of a generation with the power to improve their social and economic circumstances. In addition to rigorous fund raising efforts, the volunteer fees associated with VEP go towards paying Ecuadorian students' high school fees. War News Radio (WNR) continues to fill the gap in the media's coverage of the conflicts in Iraq and Afghanistan by providing balanced and in-depth reporting, historical perspective, and personal stories. Today, WNR is heard across the country on over 50 radio stations and around the world by thousands online. Visit www.warnewsradio.org. Taller de Paz created fun, interactive, and educational workshops that provided the tools necessary for self-expression and empowerment for kids and their families who have been displaced by the 60+ year internal conflict to be agents of social change. The members of Taller de Paz (Workshops for Peace) were named Periclean Scholars in Spring 2011. Taller de Paz started out offering four workshops (Art, Leadership, Inquiry, and Storytelling) plus outings with the kids and graduation. The group later created a Comité de Padres (Parent Committee) in order to ensure the sustainability and future of TDP. TDP, represented by Alexander Frye and Deivid Rojas, was invited to speak at the Third International Conference on Women's Safety: Building Inclusive Cities in Delhi, India in November of 2010. Kennett Square Project aimed to engage the existing community and student groups together in a single program under the Kennett Square title - the Kennett Square Project - so that they may feed off each other to further their impact. Seed funds were used to conduct community assessment and further research to determine Project feasibility. ​NICA was a group of Swarthmore students partnering with a Nicaraguan non-profit, ASODECOMAT (La Asociación del Desarrollo Comunitario de Matagalpa). The wrote, "We are helping to expand an existing youth-development program in 7 rural communities in Matagalpa, Nicaragua. This youth program provided psychological care to children subject to domestic violence and allowed them to make artisan crafts that will encourage and enable economic empowerment. Seed funds were used to conduct community assessment and further research to determine project feasibility. Student Healthcare Action Network (SHAN) sought to leverage their unique position as students to push for progressive victories towards universal health care by facilitating and organizing a direct action campaign at both the national and local levels. SHAN used seed funds to produce a comprehensive and attractive organization website.